The 236th meeting of the NY Comics & Picture-story Symposium will be held at Parsons School of Design. Free and open to the public. 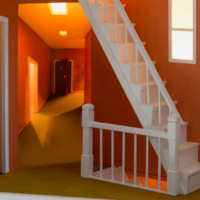 Susan Leopold on the art of the miniature, narrative constructs and the duplicitous nature of architectural perspective. Susan Leopold will discuss her most recent diorama box sculptures and the narrative construct addressing how urban spaces often have multi-purpose uses and act as gathering points for the human experience. Her own artworks will be shown along with other works that have inspired her process. She will discuss how narrative is established in these sculptures, the psychological implications of working small scale and how she manages to create these complex illusionistic spaces within the confines of a small box. Leopold is a sculptor and installation artist living in NYC whose career spans nearly 35 years. She is represented by Elizabeth Harris Gallery, NYC, Zolla/Lieberman, Chicago, and was represented by John Weber Gallery for many years. Leopold’s artwork has been featured on the cover of Art Forum, reviewed in the New Yorker, The New York Times, ArtNews, and numerous other art publications. Leopold is a recipient of the 1989-1990 Indo-American Fellowship and Fulbright Fellowship to India, New York Foundation for the Arts and most recently was commissioned to create work for Planet Word a new museum opening this spring in Washington DC. Selected exhibitions include The Whitney Museum of American Art, Mass MOCA-KidSpace, The Institute of Contemporary Art at Maine College of Art, Portland, ME, and The Hudson River Museum. Her works are in many private and public collections including The Butler Institute of American Art, The Brooklyn Museum of Art, The Los Angeles County Museum of Art, among others. Leopold holds a Masters Degree from the Interactive Telecommunication Program in the Tisch School of Arts, New York University, and a BFA from The School of Visual Arts, New York City. Leopold teaches at Parsons School of Design and Borough of Manhattan Community College. This event is presented by Parsons School of Design and Parsons School of Art, Media, and Technology.